These words are carved over the doorway to El Tovar at the Arizona Grand Canyon National Park. Sedimentary rock layers in the canyon range from about 200 million to nearly two billions years old. The earth is 4.54 billion years old, give or a take a few million, so that puts it pretty well into perspective, although you should really contrast those mind boggling numbers with the numbers that signify your personal age in years and that puts it even more in perspective. For that reason alone, I mean for perspective on those ‘What’s it all about? Why am I here?’ type speculations, the Grand Canyon is worth a visit. 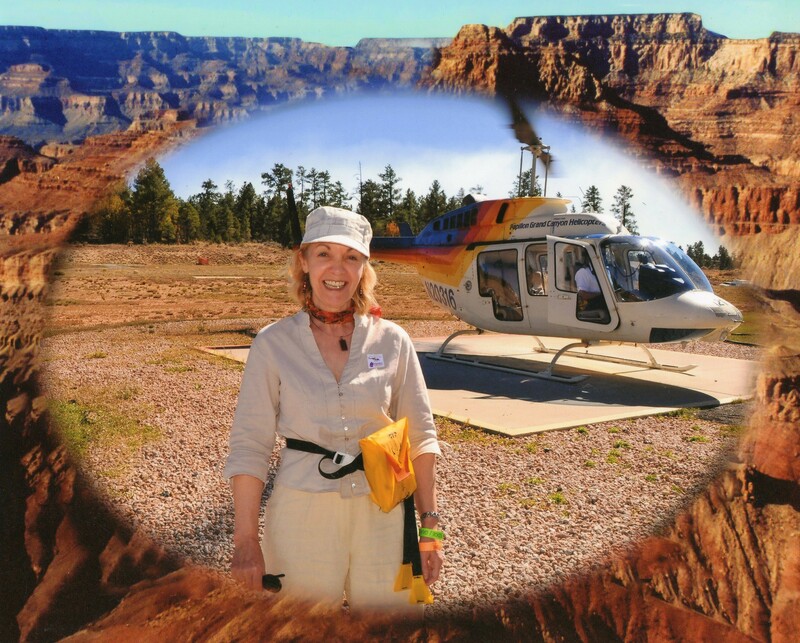 The helicopter experience: The tour bus from Las Vegas carried 75 passengers only five of whom had elected to fly the canyon — myself and four large Polish men visiting from Illinois. The bus driver via PA announced ‘flyers’ would not be served lunch until after the flight as it could ‘come out both ends’ but we need not be nervous as there were bags aboard for the use of. I, and the four Polish men, were taken to a small side room and shown three safety videos elucidating the range of seat belts for various helicopters and the somewhat confusing system for fastening and unfastening them, the flotation device we would wear while aboard, and the location of the vomit bags. I signed a waiver absolving the company of all liability is the case of my death or injury and stood on a scale to be weighed. I, as the lightest of the five, would take the co-pilot seat. A staff member fitted the flotation equipment around my waist then I was instructed by a grim looking photographer to stand and be photographed. I guessed this photo would be shown to my children in lieu of identifying my eviscerated and scorched remains after the helicopter crash into the canyon’s depths. The thought of my next of kin looking at my photo under tragic helicopter crash circumstances made me laugh happily. I discovered later the photo was meant just as a souvenir of the Grand Canyon. See how happy I look. Levity aside, I count this experience as one of the most wonderful in my life. The Canyon is vaster, wider, longer, deeper, than I had imagined. Carved by eons of time, by cataclysms, climate change, water and ice, coloured by nature, more achingly beautiful than any sculpture or painting I have ever seen, I understand why ancient peoples held this place sacred. Dreams of mountains, as in their sleep they brood on things eternal. Excellent work mom – I see you have added uploading pictures to your repertoire!